One of the greatest challenges to fighting terrorism are the loopholes that exist because of the democratic tenets that nations subscribe to. Often manifesting as rights conferred on citizens by the constitution of the country, like freedom of expression, provisions that were intended as safeguards are exploited by terrorists to commit their wicked acts without having to answer for their crimes. When terrorists hide under such rights, it becomes difficult for the security and law enforcement agencies to go after them as they would have gone after those with guns and explosives. It is a major frustration in dealing with extremism and terrorism around the world. It is a catch twenty two for those fighting terrorism. They can kill off the gun wielding and explosive carrying terrorists as much as possible. But the bigger threat is from those that deploy intellectual resources to incite the fighters, demonize the state and sow terror in the heart of citizens with their words. It does not help that those who belong to this intellectual arm of terrorism wear a toga of respectability that makes them highly believable and seemingly untouchable. They are often “respected clergy”, activists, pseudo-journalists like Ahmad Salkida and just any other position that tend to confer a semblance of immunity from being called to account for being a terrorist. One Dr Idris Ahmed of Citizens United for Peace and Stability [CUPS] understands this dynamic and is milking it for all its worth. His past time of terrorists’ supporting is done in the open as he continually heckles the military as his contribution to distract those that are committed to sacrificing their lives to buy Nigerians peace. Sadly, shutting down Dr Idris Ahmed is not going to be an easy task as he has been able to set up multiple smokescreens that give him the façade or respectability – he poses as an NGO that is out to provide relief, he impersonates as an activist, pretends to be a journalists and grandstands as an activist. Yet, the closest description that fits Dr Idris Ahmed is the hook-handed Mustafa Kamel Mustafa also known as Abu Hamza al-Masri, who hid behind the respectability of being a clergy to preach hate and back terrorism in the United Kingdom. For a long time that country did not know what to do with him and how to deal with his excesses because he has human rights such as freedom of expression as a shield. It took the United States to jail Hamza at a high security, Colorado prison ADX Florence after he was convicted of all 11 charges on terrorism offences preferred against him at Manhattan’s Federal Court. Dr Idris Ahmed as Nigeria’s Abu Hamza has been preaching hate against the Nigerian military and its personnel in the hope that he can turn citizens against the institution and win some advantage for the militant wing of his terror cell. It has since been discovered that Dr Idris Ahmed is being instigated by the Islamic Movement of Nigeria (IMN) and other dissident elements that are desirous of a weakened Nigerian Army. His strategy is to blackmail the Federal Government with its war against Boko Haram and other terrorist elements. This has manifested as series of misleading reports that alternate between extreme assertions that have been repeatedly proven false or facts distorted beyond comprehension. He would accuse the military of being ineffective in fighting terrorists and in the same breadth accuse them of scorch earth approach in decommissioning terrorists’ camps. He will champion cutting off funding to the military and in the very next minute accuse the institution of not providing enough hardware for troops to take on insurgents. He has recently come to layer these confused ranting with allegations that funds are being diverted, something stated categorically as he held the purse strings of the military operations in the North-East and is conversant with what came into the military’s coffers and what was spent. But Dr Idris Ahmed has been unable to verify his claims. What has consequently happened was that he took to Facebook to announce massive corruption in the Nigerian military but was soon out of his depth as he was not able to substantiate his claims. He had to return to the same Facebook to attempt crowd sourcing evidence and documents to save face after it became apparent that Nigerians who are ticked off by his antics were on the way to exposing him as a man that lacks no information about the war against terrorism, one that runs his mouth like someone currently abusing psychotropic substances. His attempt at crowd sourcing military documents have even been flagged by some people as code for seeking latest information on troops logistics so that he can deploy the intelligence so gathered in the service of the terrorists to who he has been linked. This is one conjecture that Dr Idris Ahmed has not come out to debunk, which tends to lend credence to the claim. Given the spate of ambush on troops in recent weeks, this is one direction that the military, especially the Directorate of Military Intelligence, should pay attention to. They need to monitor and analyse the chatter on all the online platforms where Dr Idris Ahmed ply his poison because the interactive sections of such platforms may host forum where terrorists freely share ideas. The only nuisance value coming from this man so far is that he guessed right by targeting the army as the institution that stood between Nigeria and Boko Haram with other extreme groups like IMN, which made it eligible for demonization and constant attacks. Other facts that he had attempted to manipulate simply failed to fly. All he tried to adduce did not add up. All the allegations that he made against the army in the fight against Boko Haram turned out to be lies for which he now desperately shop for evidence to make stick. 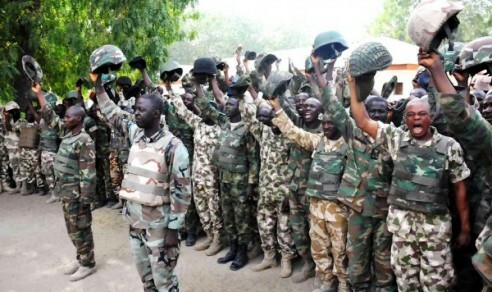 The Nigerian Army was fortunate that for the first time its efforts have been noticed by Nigerians who expressed overwhelming support for its operations contrary to the desire of the terrorists’ supporter to discredit the organization. The respectable thing for Dr Idris Ahmed to do now that the Nigerian Army has been vindicated is to tender unreserved apologies to Nigerians and the commanders he has maligned. Such apology must however only be considered as deserved from a moral perspective, something to redeem whatever if anything is left of his soul and humanity. On the legal front, Dr Idris Ahmed should be tried for aiding and abetting terrorism, managing propaganda for terrorists, colluding to leak sensitive military documents, passing state intelligence to terrorists and any other indictments that would give him 11 counts charge of terrorism like Abu Hamza. This charge for terrorism is something that authorities must immediately work on as we must not like the UK wait for the United States to request the extradition of Dr Idris Ahmed of CUPS for supporting terrorism before we act to stop his evil work. The country must be categorical in putting an end to people hiding behind the safeguards provided by democracy to preach hatred and openly support terrorism. Suleiman is a public affairs commentator and wrote from Katsina. A New Year Prayer for the State of Osun!